Beauty Bridge, a cosmetics retailer, partners with Brafton for website content and social marketing.A Pinterest contest alone generated hundreds of qualified leads. Beauty Bridge is a high-end cosmetics and beauty products retailer based out of Nutley, New Jersey. Beauty Bridge’s Managing Director and Marketing Manager Gohkan Erkavun understood the company needed to embrace social media marketing to compete with big-name brands. Beauty Bridge, a long-time Brafton partner for website content, turned to Brafton to improve social engagement and direct audiences back to its website using Pinterest. The results are “tremendous,” according to Erkavun. Brafton has attracted new social media followers and site visitors with a Pinterest marketing strategy and driven revenue for the brand. Erkavun wanted a partner to provide valuable content that drives traffic and conversions for BeautyBridge.com. The company had previously worked with a smaller consultant who offered social media marketing services, but fans weren’t visiting the site. The company needed a blog to drive engagement back to its ecommerce web pages. Through an online search for content creation and marketing agencies, Erkavun found a fit in Brafton. Brafton had been working with Beauty Bridge for more than three years on website content marketing services, but Erkavun recognized the need for additional social media marketing help to remain competitive. Brafton’s social media strategists proposed Erkuvan focus on Pinterest marketing. The company already had a Pinterest account with a large number of boards, but it lacked a result-focused strategy. Brafton’s social team saw an opportunity to capture leads with compelling images, something many B2C clients had successfully done on Pinterest in the past. The new strategy would focus on creating boards that engage online customers and establish lifestyle thought leadership instead of just showcasing products. Brafton’s social media strategists advised the client to launch an organic campaign that took advantage of seasonal trends. Together, they introduced the “Spooky Beauty” contest in October 2012. 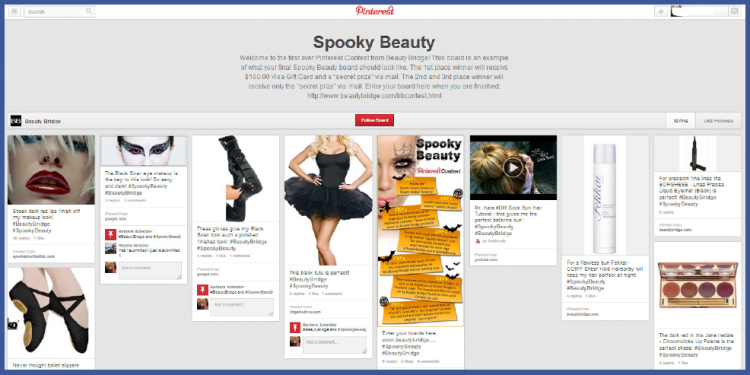 The campaign asked Pinterest users to create boards about their ideal Halloween costumes, pulling from Beauty Bridge’s product Pins and pictures of clothing, hairstyles and makeup techniques on the network to piece together a complete ensemble. Beauty Bridge started to see immediate results after refocusing its efforts on Pinterest. Three weeks after the Spooky Beauty contest launched, Beauty Bridge doubled its followers, drove substantial traffic to its contest website landing page, collected contact data from hundreds of qualified leads and saw time on site quadruple. The majority of this traffic clicked through to product pages, and 10 percent visited the brand’s high-end premium style kits. Beauty Bridge continues to see impressive results from Pinterest, with overall visits to its site increasing 131 percent between Q4 2012 and Q2 2013. 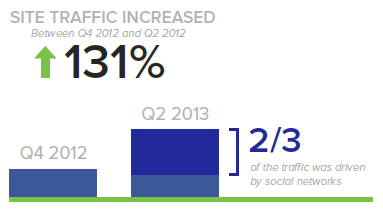 Social networks were the source of more than two-thirds of those visits, with Pinterest as a leading traffic driver. Since Beauty Bridge launched its Pinterest campaign in Q4 2012, social content has reached wider audiences and driven visitors back to the brand website where they view multiple pages. Referral traffic from Pinterest increased 59.6 percent, while unique Pageviews ose 198 percent and average pages per visit shot up 86.75 percent. 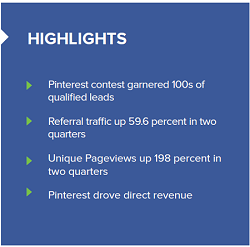 Between Q4 2012 and Q2 2013, the number of unique visitors navigating from Beauty Bridge’s Pinterest page to its website increased 60.5 percent. Brafton has helped Beauty Bridge construct a strong Pinterest presence. The company is recognized and rewarded for being highly active on the site, with a strong virality rating and healthy Pinfluence score (the relative measure of popularity, influence, activity and reach). What’s Next for Beauty Bridge? Erkavun is happy with the brand’s Pinterest performance, but he and his Brafton team have more in the pipeline. Beauty Bridge is in the process of evaluating potential video marketing concepts. The company has also started work with Brafton to create joint social media contests with other retailers across networks, including Facebook and Pinterest.